These original and one-of-a-kind pieces of art were created using Pen & Ink, Watercolor Pens, Colored Pencil, and Glitter Pens on quality watercolor paper. You can purchase them through eBay and are listed as auctions. The auctions end on the evening of Wednesday, April 9. 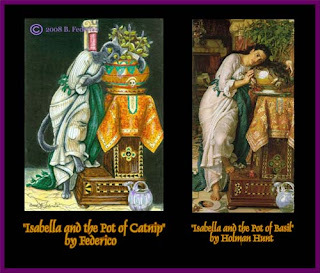 One is a parody of "Isabella and the Pot of Basil" by Holman Hunt and the other of "Pandora" by Dante. 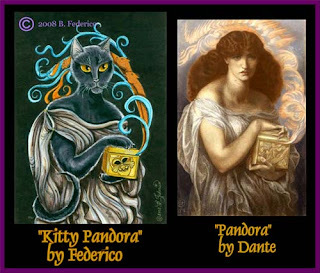 Click on each picture and it will bring you to each auction.